House is coerced into going to his father's funeral despite his protests. His team takes on the case of a young woman who collapsed while in China searching for her birth parents. 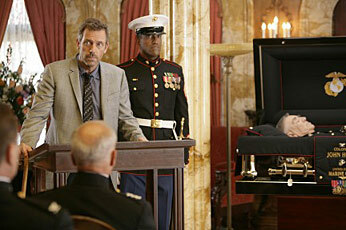 House works with the team via cell phone, while Wilson drives him - reluctantly - to the funeral. House's phone is taken by a cop mid-diagnosis and the team must decipher House's last statement. Meanwhile, the story of how House and Wilson met for the first time is revealed. Final diagnosis: Metal pins in brain displaced by a magnet.